Though I sometimes felt last year like every day had another sewing repair project, I wouldn’t say that I did it well. I could thread a needle and poke it through enough times to get whatever I was sewing to hold on, but it wasn’t pretty. Buttons were even worse. I am of the last generation to have taken mandatory home economics, but that was too long ago to count. So I decided that to prepare for this year’s ‘Ride, I needed to learn to hand-sew properly. My knitting lesson of January has morphed into a minor obsession (I was warned! ), and the cabled scarf that I finished this month looked like the perfect place to renew my sewing knowledge. With the tutelage of masterful seamstress mom, I hand-sewed on a peacock patch. A small project, to be sure, but it included all the things I needed to know to do repairs on the road better. Another practical lesson for my ‘Ride, I practiced over 3 dozen knots of all kinds: knots for securing an item, knots for joining ropes together, knots for keeping a rope from fraying, etc. My favorites – the ones that seemed the most useful for the remainder of my ‘Ride – I particularly tried to memorize. And I’m happy to say that I used a clove hitch (without googling it!) yesterday to help keep my newest knitting project from slipping off the needles. After last month’s reiki lesson, I was feeling inspired to learn about other “alternative health” methods. This month I checked out some library books on reflexology, and my boyfriend agreed to be my test subject for both hand and foot reflexology practice. For those of you who are not familiar with it, the idea is that the hands and feet can be treated using gentle pressure to activate certain energy points, and that treating the hands or feet alone can be an effective way to treat an issue in any other part of the body. For example, the heart, lungs, eyes, stomach, and so forth, all have associated points on both hands and feet. The methodology was interesting to read about and compare to the bits and pieces I’ve previously learned about for reiki, acupressure, etc. But the results as reported by my volunteer were not, for the most part, encouraging. It may have its uses, but it seems to me that there are more effective methods available. I almost didn’t list this one here, because I didn’t want to scare away any potential future hosts. But I was so terrible at this one that I can assure anyone who may be concerned that not only have I no interest in picking your locks, but the chance that I could do it if I tried is next to none. Lock sport is the preferred term to lock picking, when you are doing it with your own locks for speed. Of course, I was going for “at all,” not a speed record. Aforementioned boyfriend owns a clear lock just for learning how to pick it, as well as a basic set of picks, so I practiced on that until my hands hurt. Which didn’t take long, because those picks are not ergonomic. By the end of my practice time, I manipulate the pins to open the lock if I was looking at them. But I could not do it when I had my eyes closed – in other words, if I couldn’t see the interior workings of the lock to know what to do next. All in all, a fascinating look at the mechanics of locks, and a fun thing for a fan of detective novels, but not something I will ever need to use. The language of the month was Greek. I traveled to Greece during college, but at the time I never was able to even learn how to say “hello,” although I could guess at reading bus destinations by recalling letters learned in math class. Luckily for me enough people spoke some English that I managed okay enough. Greek was the hardest language I’ve ever tried to learn (of the 5 I’ve studied at some point in my life so far – also French, Turkish, Spanish, and German). Not just because of the different alphabet – although that was a big part of it – but the grammar was very different from anything I have studied, and the words did not bear as many similarities as I expected to the Romance languages. Now that April’s here, I’ve started a new language, have plans for things I can learn and practice while I ride, and hope to keep it up so I will have more fun lessons to report to you all next time! You have been busy. I struggled with Turkish and then I found out the alphabet is completely phonetic. I didn't have instruction, I was immersed for two months. I've done knots since childhood. I did some macrame years ago. 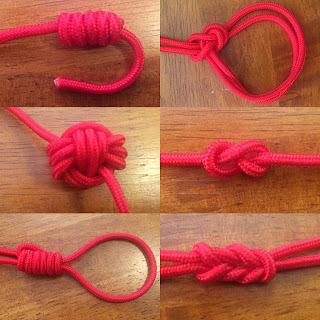 I figured out a knot called a gordian knot. All the strands enter together and exit the knot ball at the other end together. Cool stuff. How neat. Probably good I didn’t know you spent time in Turkey when we met or I would have pestered you with a million questions (its high on my travel bucket list!). When I did the Duolingo Turkish course, I only learned using westernized alphabet, but that’s encouraging. The Hindi alphabet is entirely phoenetic as well, which is certainly easier than what we’re used to!